Hello friends, in this post The definition and functions of foundation and broad guidelines for fixing the dimensions of foundation are given and different types of foundations are explained. ϕ = angle of repose of soil. built after opening the trenches to required depth. Such footings are economical up to a maximum depth of 3 m. As these foundations are suitable depth, they are grouped under shallow foundations. only one direction while in case of columns, they are in both directions. The projection of bed concrete from the lowest course of foundation masonry is usually 150 mm. 1. One way reinforced footings. 2. Two way reinforced footings. These footings are for the walls. In these footings main reinforcements are in the transverse direction of wall. In longitudinal directions there will be only nominal reinforcement. 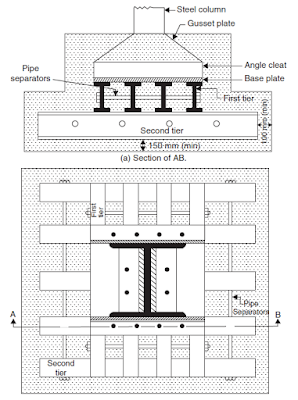 If separate footings are provided for each column, it is called isolated column footing.below Figure shows a typical isolated column footing. The size of footing is based on the area required to distribute the load of the columns safely over the soil . These footings are provided over a 100 to 150 mm bed concrete. Required reinforcements and thickness of footing are found by the design engineers. 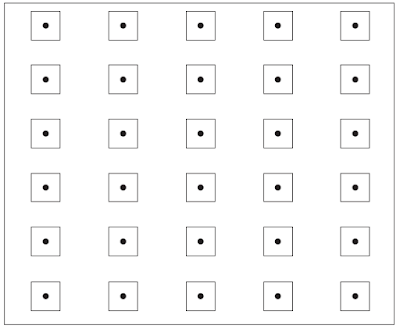 Thickness may be uniform or varying. Common footings may be provided for two columns. This type of footing is necessary when a column is very close to the boundary of the property and hence there is no scope to project footing much beyond the column face.below Figure shows a typical combined footing. The footing is to be designed for transferring loads from both columns safely to the soil. The two columns may or may not be connected by a strap beam. If a footing is common to more than two columns in a row, it is called continuous footing. This type of footing is necessary, if the columns in a row are closer or if SBC of soil is low.below Figure shows this type of footing. 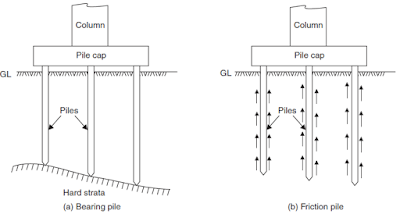 If the load on the column is quite high (Multistorey columns) or when the SBC of soil is low, the sizes of isolated columns may work out to be to such an extent that they overlap each other. In such situation a common footing may be provided to several columns as shown in below Fig.Such footings are known as raft footings. If the beams are provided in both directions over the footing slab for connecting columns, the raft foundations may be called as grid foundation also. The added advantage of such footing is, settlement is uniform and hence unnecessary stresses are not produced. load and hence they need special foundations to spread the load to a larger area of soil. Grillage foundation is one such special foundation. 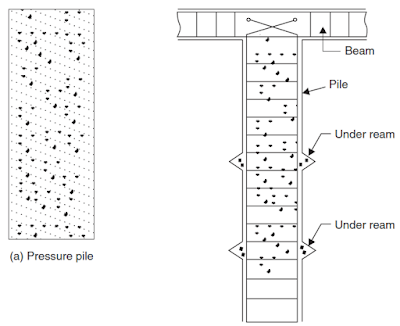 It consists of one tier or more tiers of I-sections steel beams.below Figure shows a typical two tier grillage foundation. Top tier consists of less number but large size steel section while lower tier consists of larger number but smaller size steel sections. 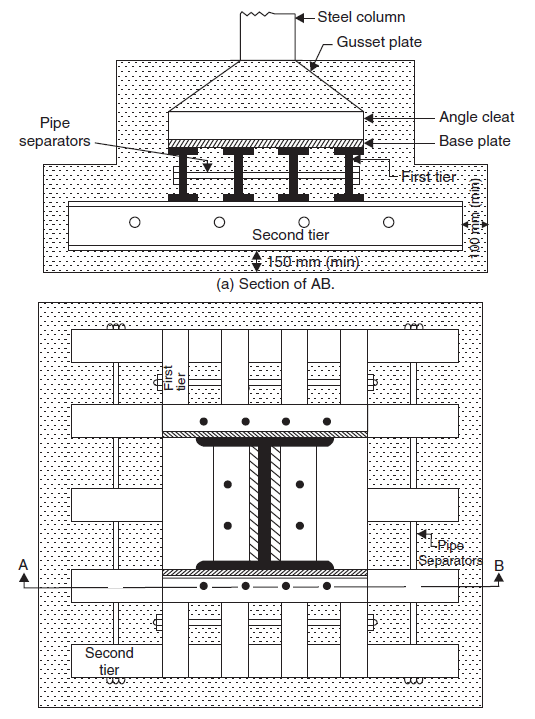 Column load is transferred to the top tier through a base plate. The grillage beams are unpainted and are encased in concrete with minimum cover of 100 mm beyond the edges of steel sections. A minimum clear space of 75 mm should be maintained between the flanges of adjacent grillage beams so that concreting can be made properly. To maintain spacing, pipe separators are used. Inverted arch foundations are provided in the places where the SBC of the soil is very poor and the load of the structure is through walls. In such cases inverted arches are constructed between the walls. End walls should be sufficiently thick and strong to withstand the outward horizontal thrust due to arch action. The outer walls may be provided with buttress walls to strengthen them.below Figure shows a typical inverted arch footing. These foundations are known as deep foundations. A pile is a slender column made of wood, concrete or steel. A pile is either driven into the soil or formed in situ by excavating a hole and then filling it with concrete. 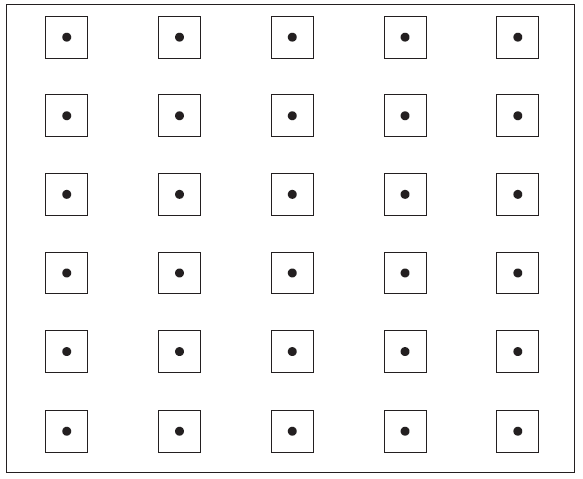 A group of piles are driven to the required depth and are capped with R.C.C. slab, over which super structure is built. The pile transfer the load to soil by friction or by direct bearing, in the latter case, piles being taken up to hard strata. This type of foundations is used when top soil is not capable of taking the load of the structure even at 3–4 m depth. Pile foundations are classified according to the materials used and also on the nature of load transfer. Circular seasoned wood can be used as piles. Their diameter may vary from 200 mm to 400 mm. Similarly square piles of sizes 200 mm to 400 mm are also used. The length of timber pile should not be more than 20 times its lateral dimension. The bottom of the pile is sharpened and is provided with iron shoe, so that it can be driven in the ground easily by hammering. These piles should be always kept below water table; otherwise alternating wet and dry condition cause the decay. These piles are cheap and can be easily driven rapidly. The main disadvantage is their load carrying capacity is low and are likely to be damaged during driving in the soil. These piles may be further classified as precast piles and cast in situ piles. Precast piles are reinforced with steel and are manufactured in factories. The cross-section diameter/dimension varies from 200 mm to 500 mm. Square, circular and octagonal sections are commonly used. The length of piles may be up to 20 m. They are provided with steel shoe at the lowest end. These piles can carry fairly large loads. These piles are highly resistant to biological and chemical actions of the soil. The disadvantage of these piles is they need more time to manufacture and are heavy to handle. Cast in situ concrete piles are formed first by boring the holes in the soil and then concreting them. Concreting is usually made using casing tubes. If the hole is filled with only plain concrete it is pressure pile. The load carrying capacity of the piles may be increased by providing enlarged base. one or two under reams may be formed. After that concreting may be carried out. Such piles are known as under reamed piles. These piles are provided at regular interval of 2 to 4 m and capping beam is provided over them. A steel pile may be a rolled steel I sections, tubes or fabricated in the form of box. 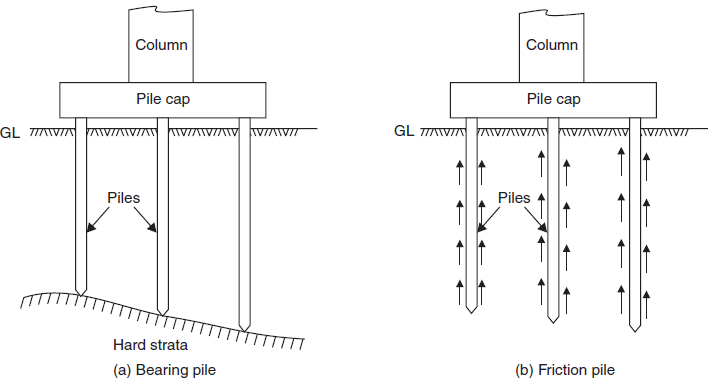 These piles are mostly used as bearing piles since surface available for friction is less and also the coefficient of friction is less. If tubes are used the soil inside the tube is driven out by compressed air and concrete is filled. These piles are very useful for driving close to existing structures since they disturb the soil least. Composite piles may be of concrete and timber or of concrete and steel. Wooden piles should not be subjected to alternating wet and dry conditions. Hence they are preferred for the portion below water table. The portion above water table are built with cast in situ concrete piles. If the required length of steel piles is less than the depth of pile, many times upper portions are built with concrete. Thus steel and concrete composite piles are sometimes used. 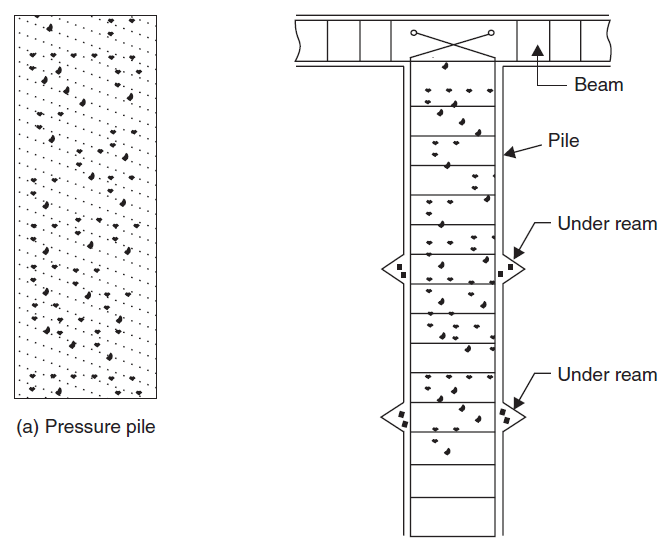 Bearing piles rest on hard strata and transfer the load by bearing. Such piles are preferred. These piles are used if the hard strata is available at reasonable depth. Friction piles transfer the load to the soil by the friction between soil and the pile. Such piles are used if hard strata is not available to a considerable depth. The friction developed is to be properly assessed before deciding the length of the pile. The surface of such piles is made rough to increase the skin friction so that required length of pile is reduced. structure and shrinkage creates downward pull. It results into cracks in foundations wall and roof. Hence foundation in black cotton soil need special care. In case black cotton soil is only to a depth of 1.0 m and 2.0 m it is economical to remove entire black cotton soil from the site and build the foundation on red soil. Apart from this black cotton soil should be removed from the sides of the foundation and filled with sand and gravel. 3. Under reamed pile foundation. Strip foundation are for walls while pad foundations are for columns. In these foundation the attempt is to keep black cotton soil from foundation by interposing layers of sand and gravel. These foundations should be constructed during dry season. 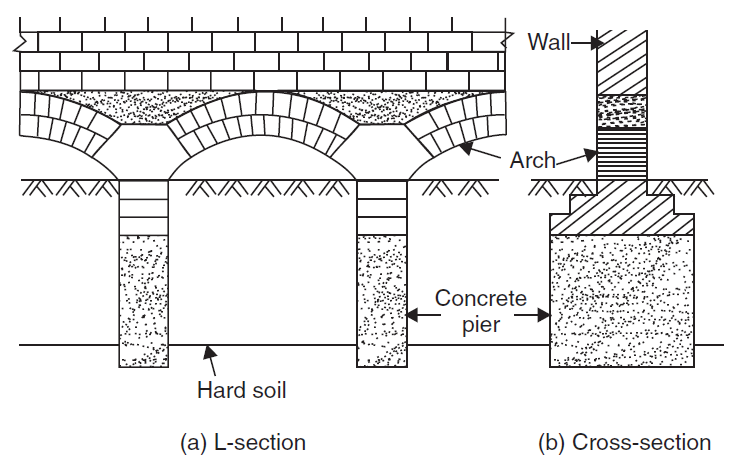 Suitable plinth protection should be made around external walls with its slops away from the wall, so that moisture do not penetrate the foundation during rainy season.below Figure shows such foundations. A pier is a vertical columns of relatively larger cross-section than piles. For walls carrying heavy loads, piers are dug at regular intervals and filled with plain concrete. These piers are taken up to good bearing strata. Then the piers are connected by concrete or masonry arch. Over these arches regular masonry is built.below Figure shows a typical pier foundation with arches. Under reamed piles are bored and then concreted at the sites. Their length may vary from 3 to 6 m. They are provided with reams and reinforcement. The pile spacing varies from 2 to 4 m. The top of piles are provided with capping beams over which walls are built. in the section where you show the piles resting atop the load-bearing strata, shouldn't the piles delve deeper by a foot or so to achieve a good purchase? Yes rock socket the tip into load bearing strata.